IdealRatings® Islamic Investor™ is the only iPhone application that tells you if a stock is Shariah compliant or not, gives you a detailed report explaining why, and alerts you if it changes status, it is designed for personal use by individual investors. 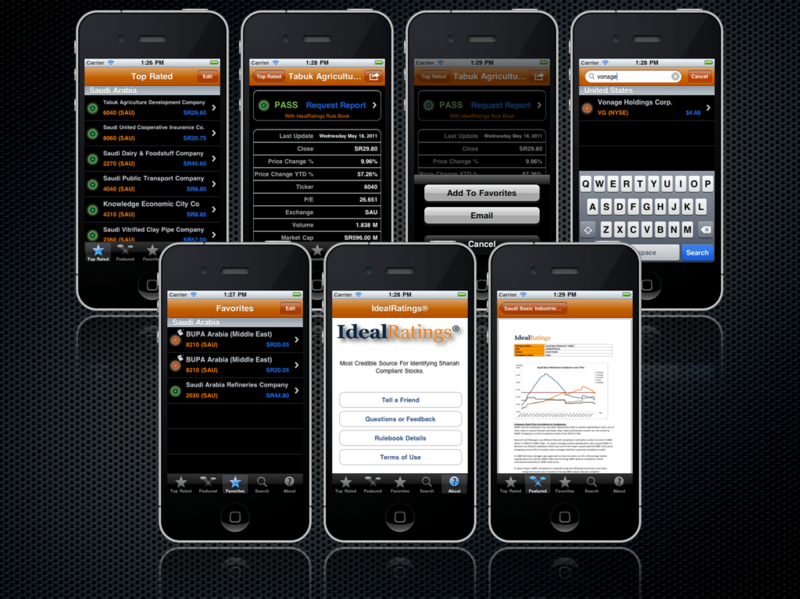 IdealRatings® is the most trusted provider of accurate, and timely, Islamic Finance information. Most Islamic index providers, and financial institutions in 18 countries rely on IdealRatings to create and manage their Islamic,Shariah compliant, products. Our data is available directly, or on Thomson Reuters and Bloomberg terminals. Find out, instantly, if a stock in your local market is Shariah compliant or not. Learn why by reading a detailed report. Explore Shariah compliant stocks from the Top Stocks and Featured sections. Track the compliance of your favorite stocks. Receive an alert if a stock changes compliance status. Share your findings with your friends and colleagues. you determine that a stock is Shariah compliant? Our analysts analyze every company to insure that its financials and business activities are compliant with the criteria in the rulebook below. What causes a stock to change compliance? Companies change business activities by buying other companies, or entering into new businesses, they also change their financials by borrowing more, or paying back loans that they owed. Because of these, and many other corporate actions, we constantly track and screen companies for compliance. Who wrote the compliance criteria (rulebook) that you use? AAOIFI (Accounting and Auditing Organization for Islamic Financial Institutions). These criteria represent what we’ve seen as the most commonly used rulebook globally, they were deduced by qualified scholars in Islam and finance to screen companies that they see fit for investment by observant Muslims. We do realize however that there is no single standard to determine what is Halal or Haram, but we determined that this should at least give an initial opinion for individual investors. How often to do you update your data? The Shariah compliance is performed daily as well. What are the criteria for Shariah compliance (rulebook) that you use?